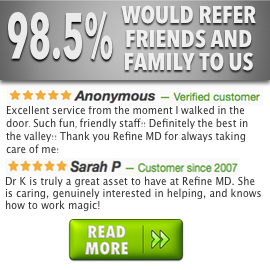 At Refine MD, our medical staff is committed to providing the highest quality medical aesthetic services possible, in a comfortable, relaxing environment. We provide services that include the best treatments available for a wide range of conditions. We provide effective treatments for conditions including hyperpigmentation, acne, crows feet, scars, sun damage, facial veins, sagging and loose skin and much more. Our treatment options for these conditions are the best available and include light therapies, advanced medical skin care, chemical peels, microdermabrasion, exfoliating facials and more. If you have a condition that you do not see listed to the right, please come in and talk to us. Our consultations are always complimentary. If we cannot provide a service you need, we will gladly refer you to a local provider who can help.